Whether it was battling rushing waters in a small raft with a guide who spoke no English, jumping out of an aircraft at 1,450 feet or helping out in a West African’s women’s shelter, Southern Illinois University Edwardsville Army Reserve Officers' Training Corps (ROTC) cadets embraced their assignments with passion and excitement. After returning this summer from extended military-related abroad training, five SIUE ROTC cadets reflected on their travels and mission in light of Veterans Day, Friday, Nov. 11. 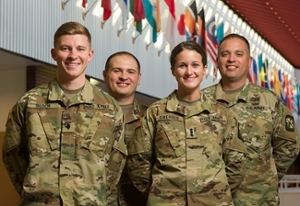 The following SIUE ROTC senior cadets were selected to participate in the specialized training of Culture Understanding and Language Proficiency (CULP), Cadet Training Leadership Training (CTLT) and Airborne School: Jacob Bloch, Justin Bristol, Lucas Smith, Angela Swenson and Blake Varady. Swenson, an exercise science major, traveled to Jince, Czech Republic. Part of her CULP training during the trip included water rafting. Varady, a political science major, spent his 21 days in CULP at the Chorillos Military Academy in Peru. Varady and his platoon interacted and trained with the academy. Bloch, a criminal justice major, did CULP training with a foreign military academy in the West African country of Burkina Faso. Smith, a computer engineering major, went to Fort Hood, Texas, for CTLT that involved tanks and other armored vehicles. Bristol’s assignment took him to airborne school in Fort Benning, Ga.
All the cadets plan to be active military once they graduate. It’s a career choice, they say, they’ve always had. It is also the cadets’ way of honoring the legacy of U.S. military service. “Veterans were willing to risk it all for every citizen, so we need reach back and pay them respect,” said Smith. He also noted that his great grandfather, great uncle, grandfather and uncle also served in the military. “I have deep respect for our veterans,” Varady said. He added that his great grandfather, Albert Laubenthaul, fought in World War II. His great uncle, Louis Varady, fought in World War I, and his crew’s canon was the first American shot during the war. Varady said the canon is display at the West Point Museum. Photo (L-R): Jacob Bloch, Blake Varady, Angela Swenson and Scott Reed.